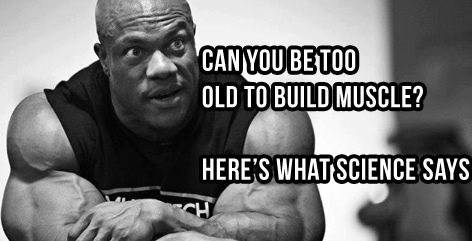 If you’re 40 or approaching 40 years old, don’t put off building the body you’ve always wanted because you believe you’re “too old”. A 2009 study  at the University of Central Florida demonstrated that any difference between the results a 40 year old and an 18 year old gets is actually very small. A 12-week study was set up with 826 men and women – the largest study ever conducted on strength training and age. The subjects trained their arms (biceps and triceps) twice a week for the 3 month duration of the study. Although the 18-19 yr olds did increase their 1 rep max by a little more, there actually wasn’t any difference in how much actual muscle size the groups added. Yes indeed. 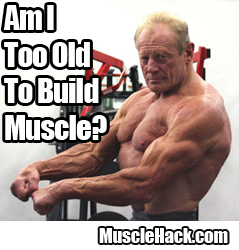 Skeletal muscle DOES continue to adapt if there is a big enough demand placed on it to do so. And the best way to place this demand at any age is with THT training. Train With Intensity – Always! Association of age with muscle size and strength before and after short-term resistance training in young adults. J Strength Cond Res. 2009 Oct;23(7):1915-20. Looks like I’ve got a long career in the gym still ahead of me, brother! You got that right, guys! hey mark, is there any other way for you to send me the new workout logs? been trying to open them and have downloaded all the necessary things and it still wont open…. Apache office don’t work and adobe and Microsoft windows. what about if closer to 50?? I used to train with weights irregularly. Then I stumbled upon THT. I started training regularly with weights on 07 Jan 2012. And now, my t-shirts tell me that I have increased my muscles. I have never been in better physical shape in my 63 years. A big thank you Mark. I am a preacher in my 60s and started working out 8 months ago. I have lost my belly and gained nice arms and chest. The best in my life. Yup, 47 here, started training again at 45, cut way back on the carbs and processed food, lost 40 lbs of fat and gained 20 lbs muscle. Fitting into the same jeans I did in my 20s, upper body stretching same shirts, though. Feels great. Hi Mark, Might be worth giving some props to the guy in the photo you used. The one and only Dave Draper, aka “The Bomber”, he was Mr. America, Mr. World & Mr. Universe, TV/Movie star. He was mine and many peoples inspiration to get in to bodybuilding. Plus one of the nicest people I’ve ever had the pleasure of dealing with. He has a great book called Brother Iron Sister Steal. Its a fascinating read. So True Mark!! 44 years young and Going Strong THT Style!!! Age 57, started weights nearly 3 years ago, gained 35 pounds muscle (135 to 170). Love the site, Mark, thanks for it. I have been using THT for sometime now and after 4 cancer ops. in the middle of last year.I have been back in the gym for the past 4 months. Did the arm blast before Xmas and increased biceps by .5″.Am now on THT5 and making good progress.All thios at 71.5 years of age. @Jason. It’s OpenOffice you need. Can’t understand why they won’t open if you have it. What error message are you getting? Really great to read all these awesome comments from you guys!! Keep up the good work!